Time. Ability. Information. Speed. Here's just one example. 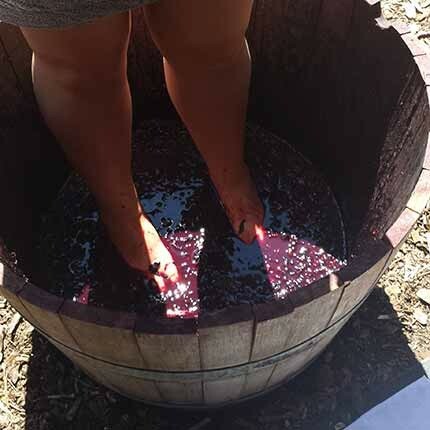 ... Amanda stomping grapes "like Lucy..."
... and a shot of the Valley on their trip. 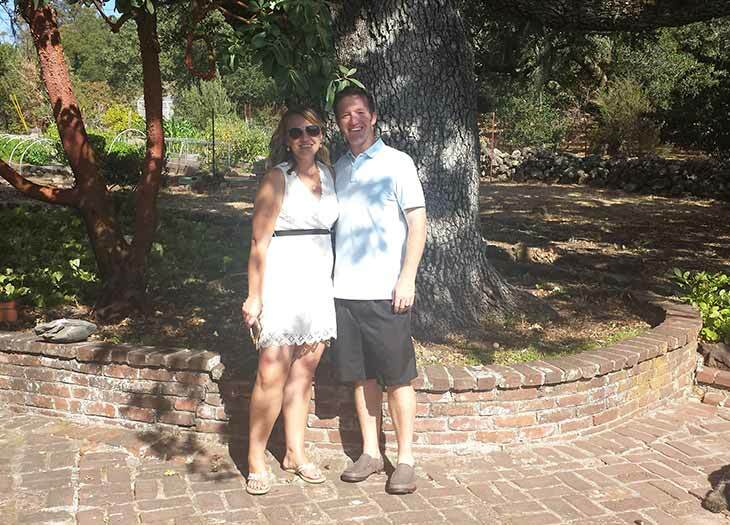 Gavin Fisher, an Indianapolis-based banker, wanted to plan a surprise trip to Napa Valley for his wife Amanda's birthday, but he knew he needed some help. The couple loves wine, but neither Gavin nor Amanda had ever been to northern California for that type of trip. There was a challenge, however: the trip had to be a surprise. "I needed someone to help out with the planning and the back-end details," says Gavin, "or I knew Amanda would suspect something. If I did all the research and booking myself, I'd be telling my wife every night that I was working late at the office. She might have started thinking something else was going on!" Gavin went to college with the husband of Virtuoso travel advisor Rachel Morrell; while he wasn't in daily contact with Morrell's husband years later, he saw a Facebook post about Rachel and travel advising. He reached out, and they scheduled an initial meeting. "It was all very detail-oriented questions from the start," says Gavin. "We were talking about kinds of wines my wife liked, kinds of hotels, kinds of experiences, everything. She understood from the beginning exactly what I was looking for and how it had to be a total surprise." Rachel found a quaint bed and breakfast in downtown Sonoma which was centrally located among the wineries where she scheduled VIP tours, wine pairings, spa treatments, and specialty dining for the couple. The goal of the entire week was to plan unexpected surprises each day to celebrate Amanda. The trip went off without a hitch – "Working with her was phenomenal," says Gavin – and the couple is now starting to work with Rachel on a family Disney trip for their 11 year-old and a 3 year-old. "I hadn't thought about using a travel advisor before I did the Napa trip," says Gavin, "but having used one, the four key things they have – that a normal traveler doesn't – are time, ability, information, and speed. When you put those things together, they can create a trip for you that you could never create for yourself." Gavin did briefly consider, at the beginning of the process, the idea that there would be upfront fees. "After the kind of trip we had, though, I honestly don't even remember the fees now. The value is just so much greater." Overall, says Gavin, "We live in a great world. I love Indianapolis but I'm pretty sure there are much greater places out there to see. Life is about experiences and breaking your routine. That's why my family prioritizes travel, and that's why it's great to work with such a valuable resource." If you'd be interested in planning a surprise trip for your wife (or, really, ANY kind of trip), click below to connect with an advisor. Jennifer Ransom Rice uses a Virtuoso advisor to help plan women's giving circle trips for the Texas Cultural Trust. Learn about the ROI. This photo right here is the first sunrise of 2015 over Hawaii. Virtuoso traveler Matt Morrissette captured it, and Virtuoso helped. But Wait, Isn't This More Expensive? Waren Buffett often says this: Price is what you pay; value is what you get. Virtuoso advisors focus on the value. If you'd like more examples of this, click below to see a few.